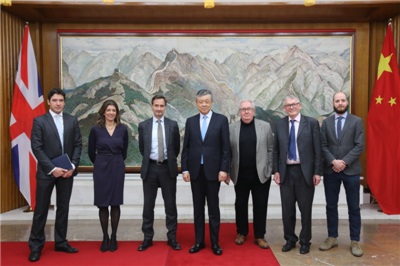 On January 9, Ambassador Liu Xiaoming held a discussion at the Chinese Embassy with renowned British Academicians. Dr Robin Niblett CMG, Director of Chatham House, Dr Leslie Vinjamuri, Head of the US and the Americas Programme, and Thomas Raines, Head of Europe Programme, at Chatham House, David Marsh, Chairman of the Official Monetary and Financial Institutions Forum, Henry Newman, Director of Open Europe, and Professor Michael Cox, Director of LSE IDEAS, were present. Ambassador Liu noted that the year 2019 marks the 70th anniversary of the founding of the People's Republic of China. China will further deepen reform, expand opening up, and adhere to the path of peaceful development, so as to make greater contribution to global peace and prosperity. He expressed appreciation to British research institutions for their interest in China and the dozens of seminars and conferences on China they organized over the past year. He also expressed the hope that they would keep expanding the scope and depth of China-related research so as to help people in the UK and the international community to have a better understanding of China. The participants said that China's achievements on economic and social development in recent years are widely acknowledged, and China's international influence is increasing day by day. In the new year, they are ready to further strengthen exchanges and cooperation with China, and make active efforts to promote the mutual understanding between China and the UK as well as Western countries. The two sides also exchanged views on international and regional issues of common concern.